MINNEAPOLIS (AP) — Jarrett Culver knew Texas Tech desperately needed him to make a big leap after a solid freshman year so he charged full-speed into an offseason determined to refine and expand every element of his game. Yet here they are in Minneapolis, a pair of players who have blossomed into bonafide NBA prospects for teams a win away from becoming a first-time national champion. Consider it proof — or maybe simply a needed reminder — that college players can still take a slightly longer path to becoming top-tier NBA prospects amid the college game’s starry-eyed infatuation with one-and-done talents. As for Hunter, the 6-7 redshirt sophomore has developed into a more assertive scorer with 3-point range. 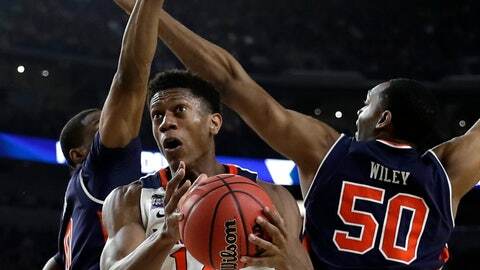 Yet it’s his defensive versatility that stands out with his ability to defend inside or out — he even checked talented North Carolina freshman point guard Coby White late in a February road win — as the Division I defensive player of the year for the National Association of Basketball Coaches.